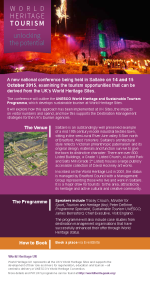 World Heritage UK is an organisation set up in 2015 to undertake networking, advocacy and promotion for the UK’s 29 outstanding World Heritage Sites, and the Tentative List Sites progressing towards WHS status. World Heritage UK has evolved out of LAWHF, the Local Authority World Heritage Forum, which was established as a LGA special interest group 20 years ago, and which did a great deal of positive action to support the UK’s Sites. World Heritage UK is the only organisation exclusively focused on World Heritage in the UK, and the only one that is led by the Sites themselves, reflecting a community-driven approach that has proven effective at many Sites and which is favoured by UNESCO. 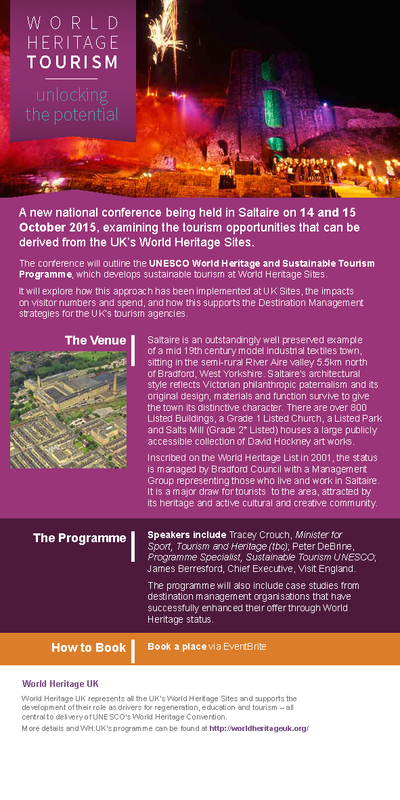 This October World Heritage UK will be holding their inaugural conference at Saltaire World Heritage Site in Bradford. Members of World Heritage UK receive preferential rates. To find out more about membership and to keep in touch with World Heritage UK and with the latest details of the conference, take a look at the World Heritage UK website and sign up to the World Heritage UK blog which can be found on the home page of their website?